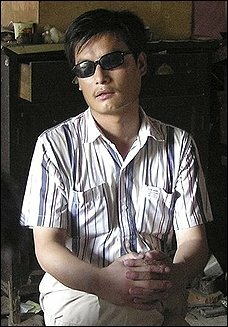 Despite serving a four-year sentence, the well-known blind lawyer, famous for his fight against forced abortions, says he is free only in his home. Still, he pledged to continue his fight for a more just China. Beijing (AsiaNews) – One of China's most high-profile human rights activists, Chen Guangcheng, said he was being held under house arrest after his release from prison where he served a four-year sentence, this according to China Aid, a US-based group that monitors the situation of dissidents in China. The organisation received a video shot by the activist’s wife. In it, the blind lawyer complains about his illegal detention at his home in Shandong province. "I've come out of a small jail and entered a bigger one," Chen Guangcheng says in the video, which was sent to China Aid by an anonymous government official who supports Chen’s fight. In their plea, the Chinese dissident and his wife call on the Chinese people and the international community to work together for a more just China. We shall “continue our fight despite brutal threats,” they say. Chen was released on 9 September after four years in prison. He had been convicted of "wilfully harming public property" and "gathering masses to disturb traffic order”. In reality, the authorities had been after the lawyer because of his indefatigable work on behalf of women and against forced abortions, a practice that is part of China’s infamous one-child family planning policy since the 1970s. He has worked primarily in Henan province, where he was able to expose and stop forced abortions and sterilisation by local family planning authorities. Chen has been a familiar face both in and outside courtrooms. Over the years, he has become one of the country’s best known and better loved public figures. On 13 September, soon after his liberation, he disappeared again. Even US Secretary of State Hillary Clinton has called for his release.